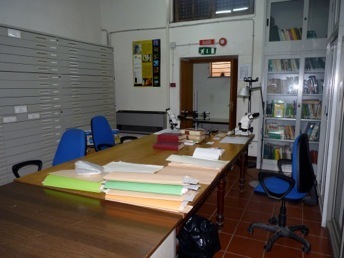 The Herbarium Mediterraneum is a scientific museum of the University of Palermo, attached to the Department of Botanical Science. It is open to researchers according to the following access policy and consulting conditions. Scholars and researchers of the Department of Botanical Science can freely consult material in the Herbarium according to the opening times. Ph.D. students, scholarship or research grant holders of the Department of Botanical Science can also access to the Herbarium collections after their supervisor’s request to the Director Office. Similarly, University students and specialist visitors are requested to submit their application form to the Department Office before consulting the collections. Ph.D. students, scholarship or research grant holders from other Departments and visiting scholars are also allowed to use the collections for research purposes with the approval of the Director. The Herbarium is open from Monday to Saturday during University Terms. It is close on Sundays, Bank Holidays, extraordinary closures and during Summer Vacations. 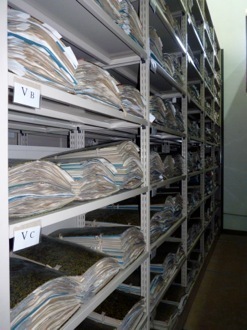 According to the staff availability, the Herbarium can also be visited in the afternoons from 14,00 to 17,00. Exceptionally, visiting scholars can ask to extend their permanence outside opening times, only if authorised by the Director. -Main doors and windows must be close at all times. -Fire, inflammable liquids or instruments are not allowed inside the building. For specific needs, please contact staff members. -Plant material not yet disinfested must not be taken neither into the Conservation Room nor into the Reading Room, but left outside in the room dedicated to the preparation and the disinfestations of the specimens. -All persons using optic instruments, other facilities or books belonging to the Herbarium shall leave them on the tables or replace them on the shelves in the same conditions in which they have been found. h)specimens shall not be moved from the Herbarium, except with the permission of the Director. B-Folder replacement inside the cabinet. a)After their use, folders shall be left on the tables of the Reading Room to the care of staff members, or replaced inside the cabinets by the scholars. The cabinets shall be close.